TWO MISFITS. ONE EXTRAORDINARY LOVE. It's 1986 and two star-crossed teens are smart enough to know that first love almost never lasts, but brave and desperate enough to try. When Eleanor meets Park, you'll remember your own first love--and just how hard it pulled you under. A cross between the iconic '80s movie Sixteen Candles and the classic coming-of-age novel Looking for Alaska, Eleanor & Park is a brilliantly written young adult novel. There are books that I absolutely fall in love with and it hurts when it finished. That is how I felt about this book, I wanted more. I loved Eleanor. She is funny, intelligent, and down to earth. I also liked how Rowell didn't make it super pretty or thing. Instead, she has "flaws" and that is one of the reason that Park likes her. Park was amazing too. He was sweet, thoughtful, and just amazing. Rowell reminded me of how it felt to be a teen and in love. I enjoyed the development of the relationship and that it was slowly built as time passed. I liked the other characters in this book and just wanted more. I found the plot to be very cute and fun, but at the same time, it dealt with serious issues in a matter that I liked. I found the book intense due to this. I also loved the setting of the 1980's and how they talked about bands and comic books. I found this to be a very original book and I hope to find one like this in the future. It made me feel so many emotions and I couldn't help liking it. Rowell's writing is amazing and clever. I can't wait to read more from her in the future. It was raw and the story stayed with me after it was over. I need more. Like seriously, you need to read this book as soon as possible if you like contemporary romance. I recommend this book to fans of John Green, Jennifer E. Smith, Stephanie Perkins, and Courtney Summers. Weight has always been an issue from me. Even before I got sick, I was always insecure about showing any skin. I knew that people were looking at me and judging how I looked. When I first got sick, I lost 60 lbs and everyone was telling me that I looked amazing. I weighted under what I should. I was actually happy about this, but looking back, I looked sick. What I mostly lost was muscle from not eating and also the removal of damaged tissue and my bones stuck out. Shortly afterward, I began to gain weight from a sedentary lifestyle and large doses of predisnone. My weight went up by a lot, like I am ashamed to admit how bad it got, more than double of my original pre-illness weight. I hated how I looked so much that I wouldn't let people take full body pictures of me. I never told anyone how psychologically messed up I was. I stopped getting ready, because I didn't see a possibility of beautiful. It wasn't until I started walking in April of 2010 that this changed and almost three years later, I am still working on a healthy self-esteem. Anyways, the reason for this is before my absence, I was keeping you updated to how much weight I have lost. I am now at 90 total, which is amazing. Instead of numbers, I am focusing on small goals in both my diet and exercise. I am also keeping a list that I update daily on one positive affirmation about myself that I can't repeat until next month. Some books that I think dealt with weight issues that I really enjoyed are Fat Cat by Robin Brande, Looks by Madeleine George, Food, Girls, and Other Things I Can't Have by Allen Zandoff, Wintergirls by Laurie Halse Anderson, and Keeping the Moon by Sarah Dessen. Most recently, Park & Eleanor by Rainbow Rowell There are many more, but I can't think of them at this moment. Anyways, it is a work in progress and I am trying to become more happy about who I am. If you have any suggestions on books that deal with weight or self esteem, leave them below. I really liked Sera. I liked that she wanted to figure out who she was and would do anything to figure out who she is. She is very strong and I just adored her. Her foster brother Cody was so sweet and I just loved how much he cared and wanted to help her. Zen was a intriguing character and I want to know more about him. I found the relationship between Sera and Zen to be awesome and rather sweet. I liked that he came back every single time and wanted to protect her. The plot of this book starts slowly, but the pace quickly speeds up. I found the idea to be very complex and interesting. I found the plot and science behind to be unique. I adore Brody's writing. I found the transition from contemporary to sci-fi/mystery to be believable. 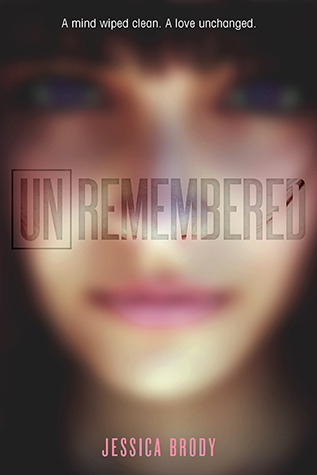 I recommend Unremembered to readers that wanted likable characters, an exciting and enjoyable plot, and a unique and interesting concept. I am really excited for the next book and can't wait to find out what happens next. I have a hard time giving up on a book. Like I can totally hate it and the book can be boring me like crazy, but I have to finish this book. I am an optimist and sadly I feel that even the worst book ever will at least have a quote or something that will make all of the time that I spent is worth it. For some books, I am angry at myself for not being able to quit a book. The only time that I have been able to do it was for Cybils and that was still extremely difficult to quit at 50 pages. I think that part of the reason is that my mom is the same way. One time, we were talking about a book that she was reading and I hated it. My mom ended up hating the book, but she still finished it. I guess it might just be the need to know if I am right or not. I think that another reason is I am always guessing if the book is predictable or not and I really like when I am right. I can also not quit series, there are only one or two that I have started that I plan to never finish. A lot of the time that I am reading isn't at home, it is in between classes, at the doctors, at the gym and on the bus. If I decide to give up on this book, I won't have anything to read until I get home, which could be hours later and in that time, I could just read the book. Anyways, I was wondering if anyone else has this issue or if you are able to quit easily. Reviews posted from these books: 1 of these books so far, some are planned to be posted later. My Favorite: I adored Also Known As, Invisibility, and Eleanor & Park. Books I hope to read next month: I would love to read The Program and Siege and Storm.